Nikon has said that it doesn't believe that pro photographers want articulating screens on DSLRs, instead choosing to use a fixed LCD for the new Nikon D800. Speaking to TechRadar, James Banfield, Group Support & Training Manager for Nikon, said, "Because it [the D800] is a pro-end camera, it's not a feature that is often asked for. "What we tend to find is that people use third party adapters when shooting video if that's what they want. "The screen on the D800 is really clear, regardless of which angle you want to shoot at," he explained. The D800 features a 3.2 inch, 921k dot, wide-viewing angle LCD monitor with automatic brightness control, which the company says is capable of delivering much wider colour reproduction than previous models. 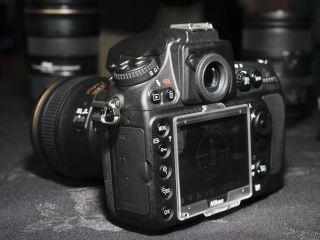 Meanwhile, articulating screens tend to be found on beginner or enthusiast level cameras, such as Nikon's D5100 and the Canon EOS 60D. Tiltable screens are a common feature often found on compact system cameras, such as the Olympus PEN E-PL3. "Articulating screens tend to be aimed at the beginner audience as they've seen them on a compact before, and they're more likely to use features such as Live View. "It's about understanding the given audience for any particular camera." The Nikon D800 also features a 36 million pixel sensor, 51 autofocus points and 6fps shooting.